LinkedIn has become the greatest network for almost every type of professional or executive – whether you are looking for new customers or partners, need to hire employees, or are searching for a new job, you do it on LinkedIn. According to LinkedIn’s own statistics, profiles with photos are 7x more likely to be viewed. 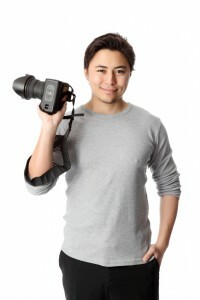 So you want to make sure that you have a professional photo – and that it’s a good one. If you are not 100% comfortable with your current photo, how do you get a better one? 1. Lean forward! They say the camera adds 10 pounds — in a headshot, extra weight shows mostly at the jaw line. If you look at yourself in the mirror, and stand normally, you might notice a bit of a bulge underneath your chin. Lean forward with your forehead, and put your chin down, as if you’re trying to read something small on the mirror. See that? That’s your jawline! By defining a clear jawline, you look slimmer and a little younger. 2. Squinch! Most of us look afraid or uncertain when we get in front of the camera – the “deer in the headlights” look. Our eyes get wide, and we look stunned or scared. To bring out the lion in you, squinch! This term, coined by Peter Hurley, is halfway between squinting and pinching your eyelids – you lower eyelids a little on the top, a lot on the bottom. For a better explanation (and some visuals), see Peter’s YouTube video. If you squinch, you look more powerful. 3. Smile! Friendly faces are more appealing. But it’s important to smile in the right way – you don’t want to look like you are laughing hysterically. It helps to have a photographer who can make you laugh, as a genuine smile will reach up and add a twinkle to your eyes. If you want to improve your smile, the best thing to do is practice! Smile in the mirror, smile at strangers (and see if they smile back!). The most important thing about your profile picture is making it look professional, while still being unique and true to who you really are. Good luck!